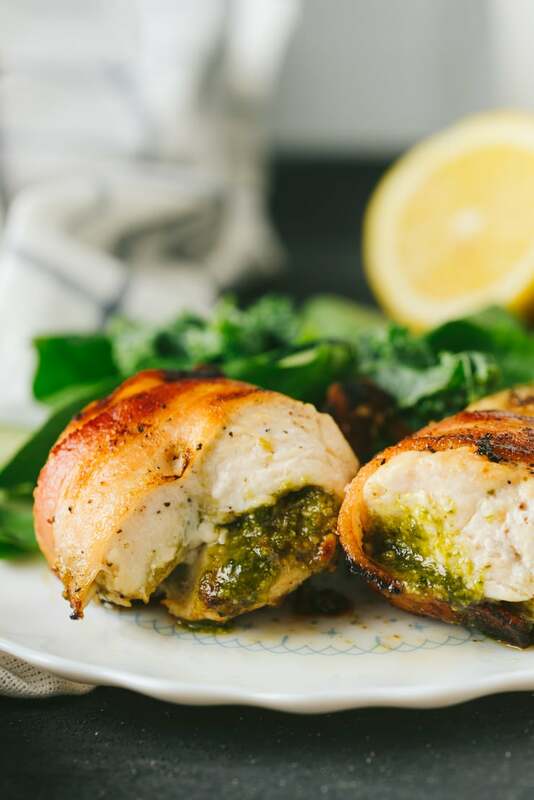 This bacon wrapped pesto chicken is a game changer, people. Let me explain why. I’ve taught a handful of classes on quick cooking over the past few years and there’s one kitchen tool I always work into my lesson because it’s my favorite — the broiler. It’s been my experience that most people are actually afraid of the broiler, and rightly so. It’s the only appliance that can turn a perfectly browned loaf of garlic bread into coal in the amount of time it takes to sneeze. BUT it’s that power and high-heat cooking that makes it such a great tool for quick and easy cooking! If you’re one of the many that equate using the broiler to cooking with the eyes of Hades, let’s think about the broiler in a different way. Imagine flipping the broiler upside down so that the heat is coming from the bottom. Now, what do we have? A BBQ Grill! You see, a broiler = an upside down BBQ grill! It’s not so scary when you think of it this way, is it? When you’re able to harness high heat from a broiler and use it correctly (aka not scorching your garlic bread), you end up with food that is juicy, caramelized (we all love those charred bits), and the best part, COOKED QUICKLY! 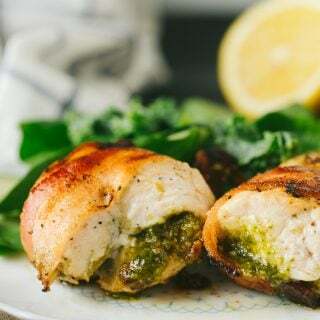 This Bacon Wrapped Pesto Chicken goes in and out of the oven in 15 minutes and only takes about 10 minutes to prep which means it can be on your table in 30 minutes flat. 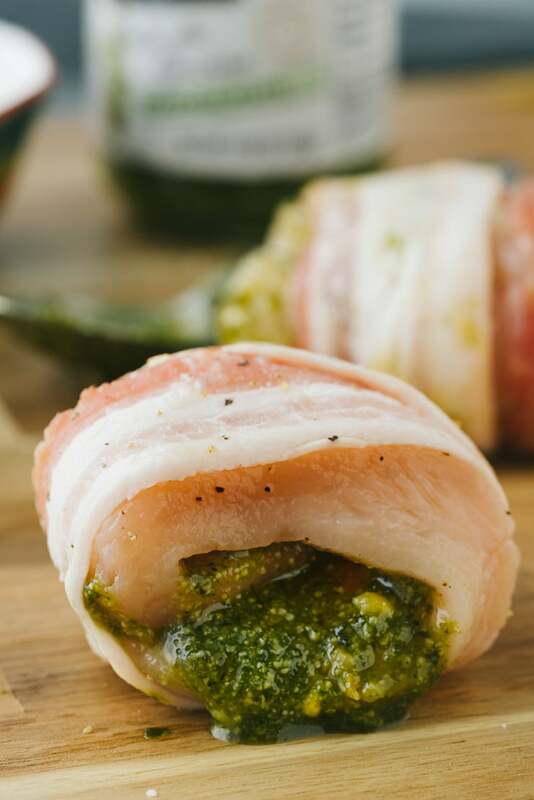 For Bacon Wrapped Pesto Chicken, Jarred Pesto is Your Friend! For quick weeknight cooking, pre-made ingredients that pack a ton a flavor are your friend. 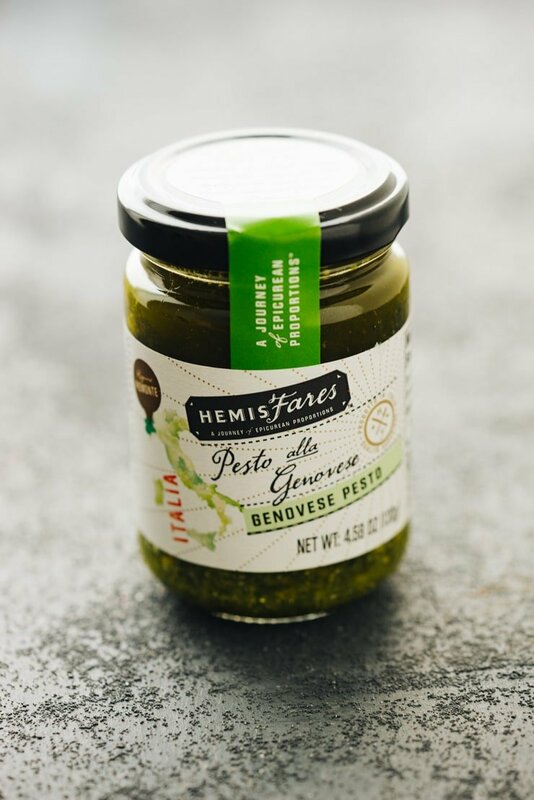 I love to keep jarred basil pesto in my pantry so I can pull it out in a hurry and use it to dress up just about anything. The jarred pesto at my local Smiths is usually on the top shelf near the spaghetti sauces. About a month ago, I posted about this new line of imported foods carried at Kroger stores when I made 5 cheese stuffed Lumaconi, and I’ve been excited to try out some more of their products. For this Bacon Wrapped Pesto Chicken, I spread HemisFares™ brand Pesto alla Genovese (Basil Pesto, Find #50) across strips of boneless skinless chicken breast that I pounded a bit to thin them out. I used about a tablespoon of pesto per each piece of chicken. I then rolled each piece up into a pinwheeel and wrapped a piece of bacon around it, securing the loose ends under the bottom of the roll. Once all the rolls were ready I transferred them onto a baking sheet, gave them a little squeeze of lemon juice over the top and popped them under the broiler. I cooked them for about 7 minutes, flipped, and then an additional 7 minutes until the bacon was browned and crisp and the chicken was cooked through. Aren’t they gorgeous? I love all the colors and can you tell how juicy that pesto chicken is?! SO GOOD! Why is this chicken SO juicy? 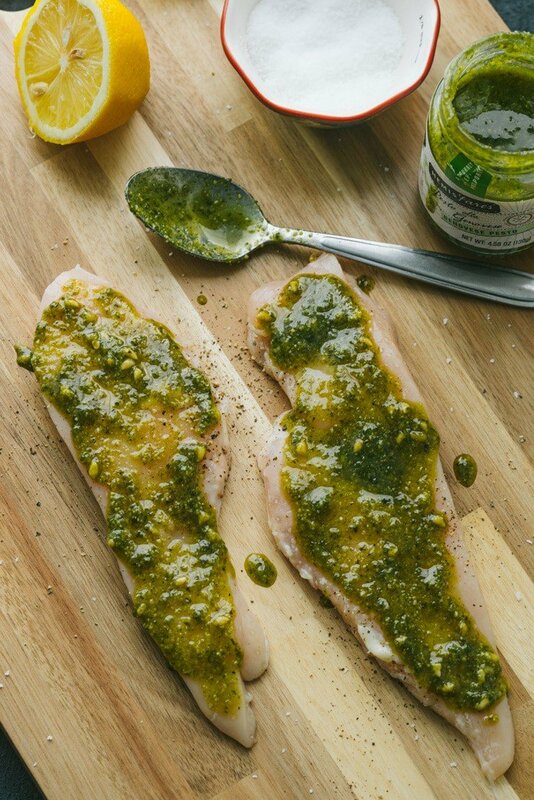 The secret really is in the pesto– it’s so full of flavor and keeps that chicken moist while cooking. 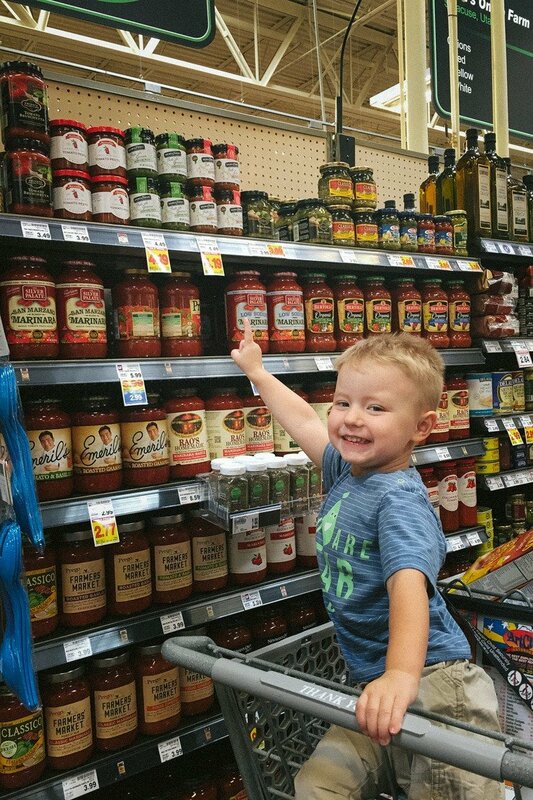 If you haven’t found the HemisFares line at your local Kroger store, look for it! There are so many fun international ingredients, perfect for quick meals and fancy gatherings alike. For more information on HemisFares you can check out the website HemisFaresFinds.com or visit Facebook.com/HemisFares. Preheat the broiler on your oven on HIGH with the oven rack about 8-10 inches from the top. 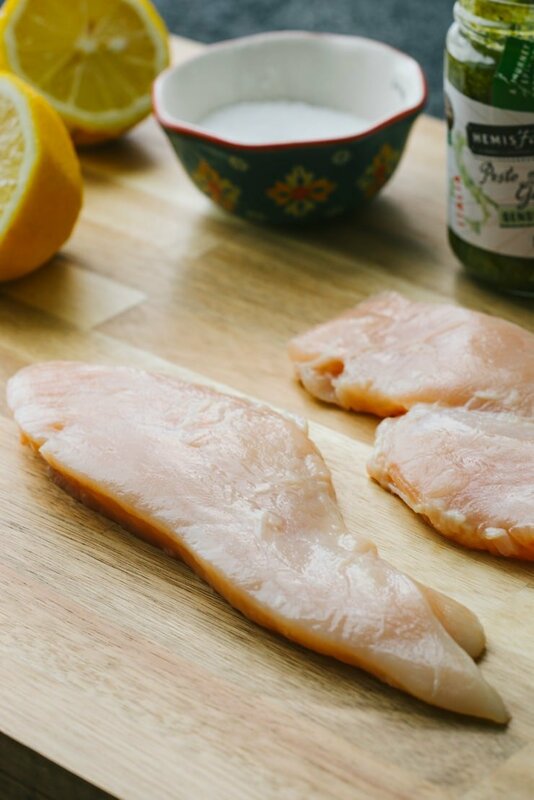 Pound each chicken breast thin until it's an even thickness (about 1/4in) and cut each in half long ways. Season each strip with salt and pepper. Spoon about 1 tablespoon of pesto over each chicken strip and roll up into a pinwheel. Wrap each pinwheel with a single piece of bacon, securing with a toothpick if needed. Place wrapped chicken on a lined baking sheet and squeeze fresh lemon juice over each of the pinwheels. Place under broiler and cook for about 7 minutes, flip and continue to cook for an additional 7 minutes or until the bacon is browned and chicken is cooked through.